This past year marked our nine year anniversary of using DIRECTV for our TV service. This relationship has lasted a lot longer than I ever thought it would. However, that doesn’t go without saying that the relationship hasn’t had its bumps and bruises. Like any human relationship, it’s about give and take, and our experience with DIRECTV hasn’t been anything different. Some of you might be saying, “How is his bill so low?”, or “How is he getting all those extra services for free?” Part of that has been because I have been a loyal customer for nine years, but it really comes down to using The Disconnection Negotiation. What is the Disconnection Negotiation? They’ll ask for your first and last name, and the amount of your last bill. So have that on hand. State that you’d like to disconnect your service, because the bill is more than you’d like to spend. The rep will typically say that they are sorry to hear that. Ask if they have any promotional offers that would help you lower your bill and free services that might help you reconsider staying with DIRECTV. They’ll usually offer $10 off/month, but ask if they’d be willing to throw in some extra channels too. It is at this point that you really need to consider, “Is what they are offering me a good promotion or can I get a better deal with Comcast, Dish, or Cox?” If you’ve done your research with your other local providers and have seen what their lowest price offers are, then it will help you make a decision when it comes to step #8. I’ve used this technique to continually keep my DIRECTV bill low, and it keeps DIRECTV pursuing me as a loyal customer. Even though it takes a little research as to what other options I have with my local providers, the savings will add up. To give you an example – with my current package – if I had done nothing, I would be paying about $120+ more per year. So basically, if I was lazy, and hadn’t fought for my bill, then I’d be out a lot of money over this next year. This is one technique I use to lower my DIRECTV bill every month, but I’d like to hear your stories. 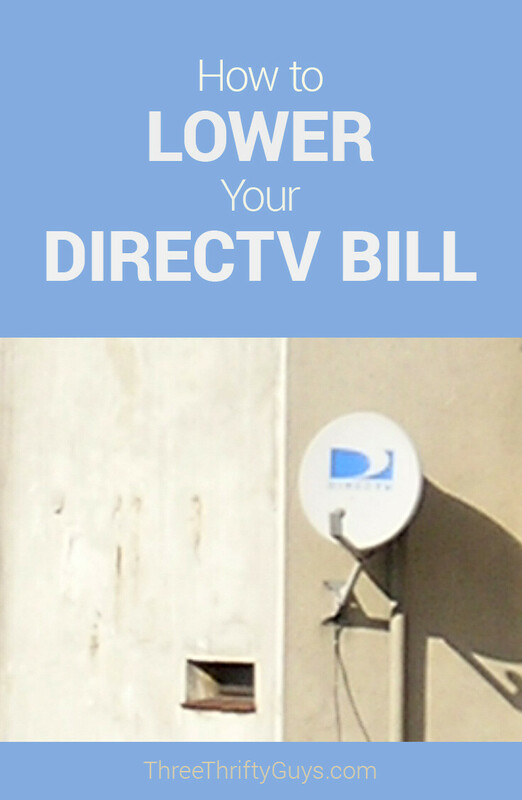 How do you lower your DIRECTV, Comcast, Cox, or Dish bills? Do you frequently switch providers? Do you use online promotion codes? Please share your money saving stories! and asked if they could discount. First guy said no offers are available. I then said fine i want to cancel. Next guy offered me $55/mo discount for 12 months and free HBO for 6 months. I would have saved more if I cancelled and then had them contact me to come back, but this is good enough. So I took the new deal. No contract. Can cancel anytime. I’ve been with DirecTV for 10+ years. Dylan – that is great to hear. I would have done the same thing. Customer loyalty goes a long way and I’m surprised that more companies don’t honor this with special discounts. Also did you and other people just receive a letter right before the holidays that they are going to increase their prices? What gives with that? I just made my annual call which knocked my bill down from $111 to around $60. They even threw in HBO for six months. At first they said that the biggest discount she could give me on my CHOICE package was only $40 and that I would need to go down to ENTERTAINMENT package to get it back down to $60. I told them that the only reason I had CHOICE was for Sports so she just gave me the ENTERTAINMENT package and threw in Sports package for free. Works for me. I’m always amazed at how varied all these offers are. I never see any consistency. As others have said, make the call today. It’s easy and painless. I called DirecTV and got customer service rep I then was transferred over to an account specialist where they offered me $80 a month discount for 12 months and free HBO and Showtime for 6 months with them taking it off for free. That is without having to extend any contracts. I told him I just wanted to save a little bit of money during the holidays. I have been with DirecTV since 2007. It’s worth the call. I just now called the DirecTV customer service number and asked what they could do to lower my bill. The rep asked me what I wanted to pay and I said about half (I paid $124 last month – we get the Choice Xtra Classic package – which includes all taxes). She tried to offer me cheaper premium channels but I told her I’m trying to reduce my expenses. She was pleasant and transferred me to the Loyalty department. This rep was also very pleasant and almost immediately offered me a $60 per month reduction for 12 months plus 6 months of the sports package for free (I won’t have to call to cancel since it just ends). Took a total of 12 minutes on the phone (so I just saved $60 per minute!) and no threats to cancel required (although I did my research about what Comcast is currently offering). Woo hoo!! I just got in a 24 month contract with direct tv but my package is $50+ tax a month for 12 months then after that I have to pay the regular price of $95 until the contract ends. Is there a possibility I can stay paying the same $50/tax a month for the whole 24 months? I called and went from 100+ a month to 45 same service for good and hbo for free for 6 mo !!! Thx for the tip ! Be real and be honest they will do what they can i didnt want to keep switching service was my claim. Wow, sorry to hear that but I’ve done this for 5 years now and it’s been a breeze every time. In fact, this time they didn’t even lock me in to a 12 month contract and STILL knocked $50 off. They even gave me a credit on my latest bill that was at the higher rate. I have been a customer since 2005. Called today because my bill went up to $ 141.00 for the extra package. Sat on the phone for an hour arguing with the loyalty dept. Tried to transfer to a supervisor but they were updating and couldn’t transfer me. They lady was rude and basically said she has nothing to offer me except lowering my plan and losing 40 channels for a $9.00 discount. I am so mad right now. Frustrating! I’d try back again – and see if you can get another agent. And then ask for loyalty straight away. I have been with DTV since 1999. I have called several times to get a better deal. The last time I called was 10 months ago. I called the retention dept. The guy I spoke to said that he thought they could do something but would have to clear it with his supervisor who was no in at that moment. He said that I had never been late and always paid my bill. About that point, he said his supervisor was there and he put me on hold for about 45 seconds. He came back on the line and said that they would lower my bill by $20 a month for 24 months and throw in HBO for 12 months TV for 24 months.. After 2 month….My bill increased again… I called again and was told there was nothing they could do. I am tired of their contracts and high prices. I’m thinking of calling again and asking what they can do.Still have 14 months of contract left. I just called in and asked to speak with the Loyalty Dept about an hour ago. Nice woman by the name of Jasmine answered. I was pleasant with her, explaining my situation to her and asked what she could do to lower my bill. Next thing I know I’ve got $55 of per month for 12 months (12 month commitment), HBO free for 6 months (no auto renewal; it just drops off after 6 months), and the kicker, free NFL Sunday Ticket for this (2017) year. Only spent 25 minutes on the phone total, and most of that was waiting to speak with someone in the confirmation dept to confirm the changes. It is amazing what a few minutes will save you over the course of the year! Thanks for commenting Andrew. I have been with DIRECTV for 4 years now. I have always had EXCELLENT customer service until recent. My 12 month promotions just ended escalating my bill by over $40. I have called them 4 – 5 times over the past two weeks. Today when I called and spoke to a woman in ‘retention’ the best she could offer me was 2 months of Showtime unlimited. I was shocked! I told her that I would really have to think about my service & consider cancelling. Do I really have to set up a cancellation date & hope to get a call back from someone, or be persistent in calling? Glad to see this discussion. I too, have been a direcTV customer since 1999, & have gotten intermittent discounts thru the years. The acquisition by AT&T has completely ruined the dtv customer service experience! That said, I finally took the time today to try & fix my svc which had been steadily climbing even tho I downgraded a year or so ago. In the most recent stmts, I had been paying $134. After a couple hours, (literally, 4 hours I’d messing with it, figuring what comcast could do, so I could contrast with dtv) & finally getting to the loyalty dept, I will now be paying ~$61!! Less than half I’ve been paying for quote a while! Only caveat is I must keep for 12 months. One discount expires in 6 mos (hbo/showtime) so will have to call again (argh), but I plan to have my roku & digital antenna by then and cut this dang cord! I can purchase the content I want monthly, & spend more on my internet speed and still pay less than what that cable bill was! Thanks to Charlie for the suggestions and for this forum! Thanks Charlie and others! In my favor, I’ve been a loyal DirecTV customer since 1998 (yes, the 19 hundreds) and was currently paying $140/mo (280 channels, 3 recv, dvr, hd) + $360 NFL/yr. I just read this article and comments, looked up best dish network promotion price for negotiating, and called DirecTV. I said I was going to cancel as my first statement. They transferred me to loyalty department and I said I wanted to cancel and go with Dish unless they could come close to $80/mo offered. I really sold the point that I was calling to cancel (and was mentally prepared to follow through with this). After a minimal amount of haggling, they gave me a $80/mo rate and free NFL ticket perennially! They also threw in 4 mo of movie channels. They will be out next week to upgrade receivers to 4k for free. $1080/yr savings!!! Steak dinner tonight. Only downside is that I need to call and renew the loyalty rate (12 mo. cycle) or the rate goes back up. Just did exactly what you said. Ten minute call – got the bill knocked down from $130/month to $78/month on my existing package. The rep was really cool about it and kept mentioning my loyalty (signed up Jan 2013). Thanks for the info! I am on the lowest package that directtv offers which is $50 a month for me right now. If I call to “cancel” what would they possibly offer me? I’ve only been with them for 5 months. Diana – you aren’t on their lowest package. They offer an unlisted “family” package for $29.99. They can offer you additional discounts to get it below $29.99. For instance, $10/month off for 12 months, and some additional movie packages. That is currently the plan I’m on, and pay about $27 after taxes and fees. You can also reference the fliers you get in the mail from DirecTV that say $29.99 for new customers. So obviously they can budge a little more than $50/month. I can’t find the channel lineup for that package. Do you know where I can? Also, is there a way to lower my bill without changing packages? If you follow the above steps, then you can keep the same package you have and they will still lower your bill. Worked for me. I’m paying $135/mo for Directv and hating it. First, I do not watch sports at all, yet I’m charged $6/mo for the “Regional Sports Fee”. Second, $7 for having two TV’s? Third, $25 for Advanced Receiver Service. Finally, $88 for the package. I can save $34 by switching to another package, but why do that. MY QUESTION IS: How to get them to drop the “Regional Sports Fee”. And is the $25 for receiver service rent? Could I buy my own DVR and save money? My first year of DTV service was up in March and my bill skyrocketed so after speaking to numerous reps that do not help you out at all…I finally contacted the cancellation dept today and was able to knock my bill down from $115 to $60 by lowering my package of course and starting another 24 month contact with $15 off each month. Didn’t work for me. I was transferred 7 times I was on the phone from 1:12- 2:56pm. The last person I spoke with kept making me repeat my phone number over and over and then she hung up. Just got off the phone with them. I had a promotional rate that expired in March, a few months shy of one year that brought my rate up by $50. Then they gave me another promotion for six months without mentioning a previous promotion would be running out at my 1 year mark. So today (two months after I spent over an hour and three separate phone calls with them), I received a bill for $165 a month. I told her I was told that my bill would be $108 a month. She said there’s no note of that whatsoever. So now they have to pull a previous phone call which can take 72 hours to 10 days and when I told her I’d rather just cancel she said fine but you’ll pay hefty fees so isn’t it worth just waiting out the call. I’ll be waiting out the call but I don’t have much hope. It seems that either they are getting harder to negotiate or just trying to rip you off when they can. Well surprise surprise no phone call was ever pulled. They actually lied to me. This makes me more inclined than ever to cancel. Today I used my sweet voice (which I have in small supply after the numerous calls) and she said she’ll have a manager call me today. I’m not holding my breath. I will call tomorrow to officially cancel if I don’t hear back. For a bill to jump 50% after one year is absurd. I used to have FIOS and wish everyday it was here. Their customer service sucked and your bill went up after the contract expired, but that was after and you could always sign on for a new package. Here I’ll actually save money even paying the early cancellation fee of $220. Today just called up to cancel my directv I was paying 120 a month. Told them I wanted to cancel they asked what I use to pay which was 70 a month. They came back offered me 60 a month for 12 months with the same package I already had. Pretty happy they gave me a good offer best thing was it only took about 20 minutes to do it. Chav – That is great to hear! It is amazing how 20 minutes of work can save you $60 x 12 months = $720. Do you realize that you just earned $2160/hour? That is a great utilization! Hi! I’m hoping I can get some advice on here. I just ordered a DirecTV bundle with AT&T internet, and it’s supposed to be installed tomorrow. The deal is $105/month for DirecTV Ultimate and Internet 50 from AT&T. It requires a 24 month service agreement for the TV, and a 12 month for the internet. It also states that the 24 month price guarantee is for the TV only. I’ve spent my morning reading horror stories about how they will raise your bill after the first 12 months. I am on a budget, and I’d like to avoid that if possible. Especially since it says it’s a 24 month price guarantee. Just trying to avoid surprises after 12 months, and then be locked in a contract I can’t get out of. I’ve spent the entire week negotiating with these people and I’m exhausted. Hahah. Any help you can offer would be great. I still have time to cancel this before tomorrow, so I need to make a decision soon! Thank you! Hi Kat. If you have the 24-month guarantee in place, they won’t be able to raise it on you. Besides, typically after that period is up, you can call again to see if they’ll keep it the same / lower your rate. I think they’ll work with you. After 47 minutes on the phone and being transferred 3 times, I was able to save $50 per month for the next 12 months! I was kind, made a lot of small talk and it paid off! I have never had such a nice experience with a great outcome with DirecTV. Thank you for the tips!! So I am just finishing year one of my two-year original contract. (We got DirecTV when we moved from the east coast to the Midwest.) Just got off the phone with the retention department and they didn’t really offer me anything except to downgrade my programming. This was after I shared how happy we were with the service but that with a new baby arriving next month we didn’t feel comfortable with the bill. In the end, I stuck with the service but told them I will likely be calling back in a few months if the bill is too much. We currently pay $65/month on our introductory plan and the bill would have increased to $115/month. Now it will be $101/month. Still WAY too high but I figured if I “played ball” with them some now I might be able to try again in the next few months. Overall, disappointed with the encounter. Receivers overheating – My 1 year contract with DIRECTV expired 2 months ago & my bill jumped up by $40 to $110 per month for the select package with 3 tv’s. On Tuesday, I started getting a message on 2 of the receivers saying that the receivers are over heating. DTV wants to charge me $20 to ship me 2 new receivers & they say that they have no promotions to offer me & I would have to go to the next lowest package to lower my price. Can I negotiate new equipment along with lower price? One of their service guys told me that since they have sold over to AT&T it is a bit chaotic within their DirecTV business. That could explain why people are getting so many contradictory messages. The service guy said one hand doesn’t know what the other hand is doing and some of their service is now off-shore and some not and it’s all simply chaotic, even for the DirecTV workers. So the strategy of calling back until something works for you makes sense at this point. I am personally sorry they sold out to AT&T, think it has lowered their overall offering especially if you live in an area where you can’t get AT&T for internet (which is my case- so I can’t bundle and get a better price that way). My negotiation experiences echo others who have commented- frustrating and definitely not easy. I am stuck with them until October of this year. They helped me out the first time my bill jumped from introductory $61 to $138 after 3 months. They lowered it to $111 for 6 months. It jumped back up to $138. We were flooded right at that point where I suspended my service for 4 months when we were out of our house — our first bill when we had service restored $316!!! I then had to call to lower my package and get rid of some of the movie channels we have – that got us down to $150 as of now but that is only guaranteed for 6 months – they would even give me 12 months price guarantee nor did they have any kind of compassion in the fact that our home was flooded and slapping us with a $300+ bill. I switched from cable to Directv right before the ATT buyout. Had I known prior to that about ATT aquiring them, I would have kept my cable package. AT&T was ALWAYS a problem for me – with all of their services. I have had them buyout companies and I’ve left every single time because they simply don’t care. They are going to keep raising prices and give us less channels no matter what we threaten because they have enough people stuck in contracts (like me) who won’t break contract and continue to pay too much for what we get in the contract. They use to thank us for being long term Directv customers, but since they tied into At&t they don’t care. In fact they have become down right rude. We’ve been with Directv since they started and bought out our old service. I tried the cancellation deal through chat, but they said you need to call in to get promotions. I called and they still gave us the run around. Now days its all about bundles. The problem with bundles with at&t is you have to be in their service area, or you are SOL. I’m researching now new services, buts its hard to find everything we want. I just Directv would go back to being just Directv. At&t stinks. Hi, I canceled my service tonight after 19 years. I gave them at least 5 opportunities to offer me something better than dropping to a lower package for $15 less per month (which isn’t a deal–it is just a different package). I had done my homework and knew a competitor could save me $70/month. ..still nothing better to offer. I know they are offering new customers Sunday Ticket for free. I disclosed I had ATT wireless. Still, no budging. I know someone will call me because I did the cancellation, but this is such BS. Reward me for being a customer in good standing for 19 years. I shouldn’t have to call 3 times to get the “right” customer service agent. Or cancel and wait for you to beg me to come back. I don’t even feel bad. I look forward to trying FIOS when we move in June. I followed these instructions and they happily canceled my service after only offering me a $15 discount. My bill had doubled overnight and they told me there was nothing they could do so I told them to cancel and agreed to pay the $220 fee to cancel early. The next day I hadn’t heard from them but got a standard flyer in the mail from DIRECTV and Dish offering a price that was half what I had been paying for 24 months guaranteed price lock for new customers. I called directv back and asked and was told that was for new customers only and if I had no further questions that they couldn’t help me since I canceled already. I hung and called right back to get someone else, they referred me to another department (can’t remember the name, but it started with a P) and they helped me instantly. I politely told them I had already canceled and was curious why I couldn’t take advantage of the same low rate as new customers and the lady immidietly said she could take my monthly price from $120 per month down to $55 per month, give me free movie channels for 6 months, credited me $50 to my account to help with the high bill last month, and dropped the $220 early cancellation fee from yesterday. So if you cancel and they don’t seem to care, like they did with me, just keep calling back and getting tansfered around. Eventually you will get in touch with someone helpful. I talked to a total of 6 representatives over the course of 4 phone calls. One offered me the $15 discount, the rest offered nothing, and finally the last lady offered me all that I got. I told her she was the most helpful person I’d spoken with and she said, “thank you I try not to keep people on the phone any longer than they have to be so I just go ahead and do all I can up front”, so it really does matter who you get in connected to. Thanks so much for the article! Persistence pays off! ctsechre – thanks so much for leaving a comment on what your experience was in trying to get a bigger discount! It is comments like yours that encourage us to be persistent and let the media providers know that the consumers are in charge. Also way to use the person’s name while talking to them on the phone! I know that I’ve gotten a better response with their customer service when I use their name and treat them well! Usually this works for me too but the last 2 times I tried, All I get is that I can move to a lower package. I am also paying $23 a month to “rent” a receiver. Anyone have tips on how to avoid $10 a month for HD receiver $10 a month for DVR receiver $3 a month for whole home receiver. I only have 1 receiver and 1 television so why is this $23 a month. Over and over she said all she could do was much me to a lower package. Can I buy a receiver somewhere else and use it instead of renting? I still wasn’t able to do anything. Maybe its because I was speaking with the retention department and not the loyalty department. I went ahead and cancelled. Must say the phone number didn’t work for me but the artical worked. Used your advise. Bill was cut in half and this months bill was credited 52.37! Thank you for you help. Glad to hear it worked! Thanks for leaving a comment! I encourage other people who find the article to do so as well. I have been a Direct TV customer since 2004. I was on a “promotions” plan which took $20 off my bill for the last 12 months. Those 12 months passed and my bill shot up $20/mo ($106.81/mo.). We’ve been on the Entertainment Package. I called Direct TV yesterday and was told that no further promotions were available. I asked to negotiate as I have been a loyal customer, but was told no promotions were available. I told the woman that I would need to discuss this with my husband and would call back if we intended to cancel. I called back today and asked to cancel. I was sent to the “Loyalty Department” and spoke with a nice rep who talked about options. By switching to another plan (the Family Package), he knocked $15/mo. off my bill for the next 24 months with no contract. I also decided to return the 2nd receiver for our 2nd TV, and that dropped another $7 off the bill. All in all, for the next 24 months our total bill will be less than $50. He told me that I should always ask for the “Loyalty Department” in the future if I am hoping to negotiate. They are trained to help keep customers and seem to have more negotiating power. Yes, I had to drop a few channels, but he asked me which channels were typically watch, and the Family Package will meet our needs. I was very pleased in the end. Thanks for your website – it gave me some very helpful tips for the negotiation! I believe your account must be in good standing and not interrupted to be able to get any deals at all. I tried calling to cancel and they would not transfer me to the cancel department because my account is interrupted right now. I also pretty much begged the representative to lower my bill or give me some credits and all she would credit me was the late fees of six dollars! Good point, Denise! You are right. You need to make sure you aren’t in a period of an existing contract with discounts already appliied, because then you don’t have any rights to cancel or face a penalty. If you cancel anyways, then more than likely they’ll call you to offer you a deal to attract you back. I have been with directv since at least 2005 and usually they lower my bill eveytime I call. This month it shot up to $117 a month and the retention department would only drop it by $14. I usually pay $76 a month. I told them I would cancel and they did not care. I asked to speak with a mgr and they said the mgr could not do anything. Blows my mind that I have been with them for over 10 years and they just did not care. Hi Misty. I would try calling again and ask for the retention dept / cancelation dept right away. This could help you get to someone whose main aim is to retain customers. That is who I spoke with and they flat out just didnt care. Usually the retention dept acts like they want my business.. I am always on time with my payment and a loyal customer. I cancelled and figured they would call and they havent. I also posted a message on their website and they asked for my account # and phone # so I will see if they call. Really even if they do drop my bill back to what it was I dont know if I would stay with them after the way that agent treated me. Same thing happened to me. The worker at Direct told me she could not even afford Direct herself and at this point the company is not giving out any substantial or worthwhile promotions. Very frustrating for families who want local sports and the NFL ticket. Trying to get that combination without Directv is impossible. I have been a Directv customer since 2007. I just got off the phone with them, trying to get my bill lowered. It went back up this month, after having a $40 a month discount for the past year. They flat out told me that my current package (Choice Xtra Classics) has been discontinued, so they didn’t have any discounts to offer me. Their only suggestion was…choose a lower priced package. When I asked to be trans to the ‘retention dept’, the rep told me that that’s who I was talking to. Finally got her to give me a supervisor to speak to, and he basically told me the same thing…no discounts available – call back next month and see if they have anything. I told them I will be checking with Dish, cuz I know I can get a better price there. I have been with them for seventeen years and this same thing happened to me. I asked them to help me lower my bill and the first “customer service” person I talked to said he could lower my bill to $65.00. I asked him four times if I would lose anything and he assured me nothing would change. That night, I turned on the TV and was shocked to find nearly all of my channels were gone…that is how he saved me money! I called back, talked to someone else and she said she couldn’t help me. Funny way to reward a very long time customer and I am looking to change to something else. I have been a direct Tv user for 6 years and my bill jumped from $99 a month to $155.80 a month and we don’t have any moves or internet or phone service with them. We can go to the cable company and get all 3 for $150.95 a month. My husband has tried for months to get it lower. When we called tonight about the bill and told them we where going some place else. They said we are sorry to hear this and my husband told them to cancel it and they did. We have the cable company coming out on Sunday. Shell – if you had waited a few weeks, then I almost guarantee that you would have received a phone call, email, and mailing, with some type of discounted price to get you back. That is what they do in order to get you to come back, and they realize that you were serious about canceling. Sometimes that is what it takes to get your bill lowered. Thanks for leaving a comment. Let us know if DirecTV tries to reach out to you again with a discounted price. Who cares if they call back weeks after? DO the morons at Directv think consumers can’t live with out their services? I lose my picture when it drizzles out. I have had Directv for years and we all hate change but I guarantee you this, if they give me crap about reducing my bill which increase at least once a year at various times then OK shut it down. I have noticed every year the package gets increased 15% then other services like the Local Sports package went from $3.28 to $7.46 the next year. My equipment total went up $2.50. They get you everywhere soothes is why you have to negotiate every 2-6 months. The people who don’t are stooges! Sorry but its a fact. Thanks for the information and tips Charlie. Your article was very insightful and provided me just the motivation I needed to get a lower bill. Here’s my story… after my 12-mo DTV promotion expiring in Jan/Feb my bill went from approximately $60 to $110. So I called DTV on Friday. The lady was nice but would not provide additional discounts and said she would have to transfer to a special promotions number. After speaking with the second person, he still would not provide any discounts. At this time I thought I would need to cancel my service (which I did mention to the second person I spoke to). On Monday morning I called back after doing a little research… when prompted by the IVR, press /or say “Cancel Service”. Once connected with a very friendly customer service rep, within two minutes she says “well it looks like we have a special promotion for you… I can save you $52 a month. Would that be good?” And she also included HBO and Cinemax for 6-mo’s. Also, since I bundle DTV and ATT wireless service, she offered to look at my data plan and gave me an extra 1 GB of data and took $10/mo. I bet their software tells them that there is a high likely hood that I was going to cancel service on my second call. And rather than having me go through the “cancellation discussion”, the rep preemptively was able to provide me with new promotions. Needless to say I will continue to be a satisfied DTV customer. Thanks for sharing your experience with us Dan / glad you were able to see your DirecTV bill lowered. 11 yr customer. Just called and got $25 off per month for 12 months with a 12 month commitment. Sweet Judd! Make sure you set yourself a calendar reminder 12 months from now to call back in and save some more money after your 12 month discount expires! Glad to hear it worked! Thanks for letting us know. I tried this and kept getting the response of “this is why they print the discounts on the bill so you know how much you are saving,” whatever that is meant to do. My bill went from around $32 (start up price) to $70 within a year. She said there was absolutely nothing she could do for me. She refused to even try. Her only option was to get rid of one of my TV’s. I have been a DTV customer for 10 years, and I agree that the cost is outrageous. I just celled them to lower the bill and went through the cancellation process. They let me cancel. I gave it a 2-week shut-off window, so it will be interesting to see if they call me back and make an offer. If they don’t, it’s no loss on my part. I can get all of the programming that I want elsewhere. PK, I am curious to know what happened in your case? Did they call you back and offer you a deal? I feel like Karl, I have been with directv for almost nine years and my bill is terrible. I do have a past due balance, but its still terrible. I have called several times and was only given $5 dollars for 12 months. It’s very frustrating but I will keep trying. Dionne – you are right. You need to be persistent. They are getting clever. Make sure you ask to be transferred to the cancellation department. That is the group that will be able to lower your bill. I must be doing something wrong. I can’t really cancel since I’m only 12 months into a 24 month contract. Their base package listed online is $90/mo. I asked 3 different times through the call if there was any way to lower it even more and they said there wasn’t. They said there was another one that would give me even fewer channels, but it was $89/mo. Should I try again tomorrow and hope for a different rep? You have to actually cancel sometimes . My buddy did this today he cancelled service they called him back after 6 hours gave him a 200 gift card. Sunday ticket for free and 53 dollars a month off the bill . They are getting smarter so you really have to go the extra step sometimes . Ask to speak with the loyalty dept! I just called Direct TV and got a $100 credit on my bill! They also said to call back in the morning to ask for promos and continuing service credits! Excellent Julie! I’m glad to hear that our money saving tip worked! Make sure you set yourself a calendar reminder on when to call back in 6-12 months to get more savings. I did call back and got my HD channels on a promo for a few months. The first guy I talked to told me that I can call every week to see what they have going! I have not been calling…. I really should bc I am broke, hahahah! That’s not too shabby of a bill. I’ve heard of people doing this from time to time to score better rates. However, I’m just not a big fan of cable companies in general. I don’t like the deceitful tactics they use to keep you on the hook for payments every month. I really hate that, after you threaten to leave, they offer to lower the cost of their service. It’s like they’re admitting they’ve been overcharging you the whole time. Anyhoo, I’m scared to death of cable companies now and switch to simple online streaming. I use a Roku to Stream Sling TV (I think it’s $25/mo) and I can cancel whenever I want and don’t have to beg for better rates. For about $15 extra I am getting a lot more value AND my local sports package. All it takes is a quick phone call once a year. I don’t see what’s so shady about it. You either make the call, or you don’t. It’s your choice. Sling TV has potential but the fact that it is streaming and not that much less is the deal killer for me. I know that I would miss the DVR tremendously. That’s a total of 30 million bucks a year for just five employees. Thing they can lower their prices a tad? These guys are pikers. The CEO of Spectrum made over $98,000,000 last year. Just did this today and went from $79.99 a month to $32.98 a month. And they cut my past-due balance in half. So glad to hear this worked for you Sue! Negotiating bills is one of my favorite ways to save money every month Charlie. I’d also add to do your research and know what the competition is offering, if they don’t offer a lot of ammo when negotiating they tell the rep you are considering switching to Netflix and an over-the-air HD antennae.